Owner has owned this vehicle for 44 years and recently passed away. 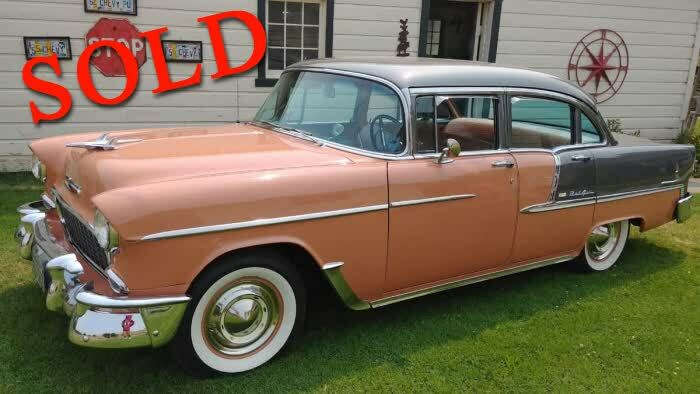 Widow is selling his Pride & Joy "55" Belair 4 Door Sedan, one of 345,372 built. Car was built in June of 1955 at the Oakland plant with a 162HP, 265 V-8 and Power Glide Transmission. Accessories include: Vent Shades, Traffic Light Viewer, Courtesy Under Hood-Trunk Light package, Tissue Dispenser, Rear Seat Speaker, Fender & Grill Guards, Floor Mats, Gas Pedal Cover, Plastic Seat Covers, Windshield, Parking Brake Signal, Treadle-Vac Power Brakes, Vanity Mirror, Day/Night Rearview Mirror, Exhaust Extensions, Gas Door Guard, & Door Handle Shields. This car is immaculate inside & out.